Did it ever happen to you that you see something that you would like to Google later? For example, you are in the middle of shopping and see an ad for the latest movie in the cinema. You don’t have the time to check it now, but you want to remind yourself to Google it later. 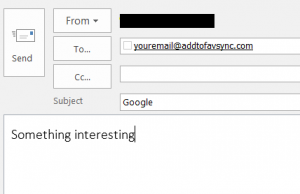 Now you can do it just that by sending an email to your virtual email with Google in the subject. A bookmark with a Google search will be created on your FavSync page and you can check it when it’s convenient for you. In case you are not familiar with the virtual email, please read this post.